LOS ANGELES (AP) — The NBA playoffs are still days away. Tell that to the Houston Rockets, who have their postseason mentality locked in. 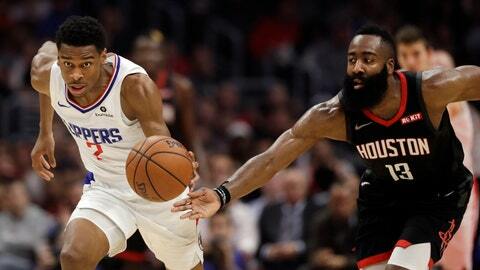 James Harden scored 31 points, Chris Paul added 29, and the Rockets routed the Los Angeles Clippers 135-103 on Wednesday night in a potential playoff preview. “It’s the best we’ve played and it’s the right time,” Harden said. The Rockets set the tone early, shooting 64% in the first quarter. Houston stretched its lead to 22 in the second before the Clippers closed on a 9-2 run to trail 68-53 at halftime. Harden and Paul dominated the third. First, Paul ran off six straight points and later Harden scored eight in a row. Paul’s back-to-back 3-pointers sent the Rockets into the final quarter leading 102-73. Rockets: They had lost eight of their last 13 against the Clippers at Staples Center. … They improved to 8-4 in the second game of a back-to-back. … The game reunited G Austin Rivers with his father Doc. The younger Rivers is averaging 8.2 points off the bench since signing as a free agent at Christmas. Clippers: G Patrick Beverley (right hip pointer) rested. … The teams played for the first time since late October. The Clippers won the first two meetings, but several players from both teams either didn’t play in those games or were later traded. … Clipper Darrell razzed Paul in his first trip to the free throw line. After making both, Paul tapped his chest and nodded in Darrell’s direction. … Rapper Ty Dolla $ign sat courtside with a small dog in his lap. Harden is one of several athletes mourning the shooting death of rapper Nipsey Hussle in Los Angeles on Sunday. Rockets: Host New York Knicks on Friday. Clippers: Host Lakers on Friday.